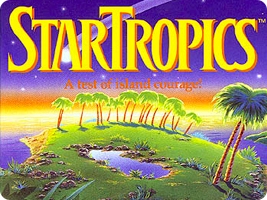 While the Nintendo IRD studio worked on a number of sports titles for the western market, StarTropics was their first adventure designed specifically for the U.S. market. Mike Jones is dropped into strange and wonderful worlds courtesy of his Uncle Jones's work as an archeologist. He must face the villainous alien known as Zoda across space and time, solving puzzles and taking down huge monsters.